I love using task cards in the classroom. I think they are a fun way to keep learners engaged. Task cards are a great option for learners who are easily overwhelmed by a full page of work. When this work is presented in task card format the work is more manageable for these learners. Task cards come in a variety of formats. They can be used in centers, for early finisher work, and for take home practice. 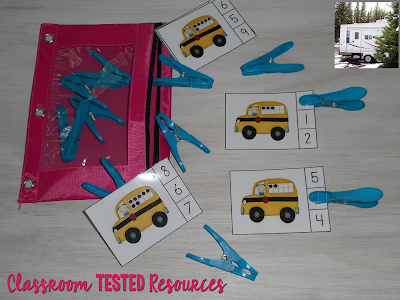 I like clip cards that allow little learners to develop fine motor control while addressing academic skills. I love task cards that get learners up and moving about for “Round the Room” and SCOOT activities. There are many good things to list about task cards. Once you have them prepared, they can be used year after year. They can be used to save paper. Kids love them. 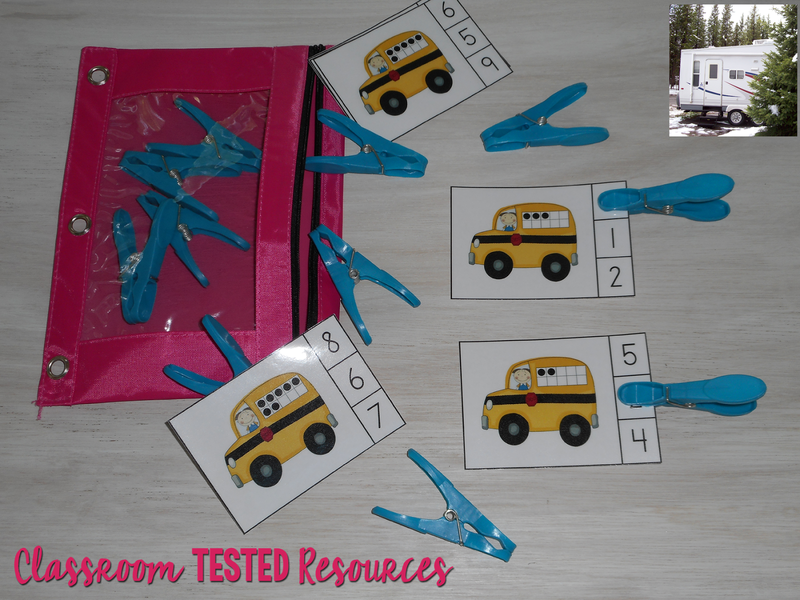 They are a refreshing alternative to worksheets. As with most anything, there are a couple of not so good things about task cards. Preparing them and storing them can be a challenge. I hope these tips will help make that task easier for you. Before printing your task cards decide if they should be printed on card stock or copy paper. How much wear and tear will be involved? Will little learners be handling the cards and attaching clothespins? Are you making the cards self-checking by marking an answer on the back of the card that will show through on plain copy paper? Printing on card stock is the best option for these situations. If you are hanging the card for a Round the Room activity, it likely will get very little wear and tear. In that case, regular copy paper will work well. Are you printing in color or grayscale? My favorite option is printing in color, but that can get quite expensive. Some task cards can be printed in grayscale on colored paper or colored cardstock saving your color ink for later. Graphics with crisp lines and few shading details work well for grayscale printing. There are some cases where printing in color is mandatory for the task involved. If an individual learner needs considerable practice on a particular skill, I print a set of cards in gray scale and send it home for the family to keep. You can look over your task card design and format to decide which printing option works best. Cutting out task cards can be time consuming. If the cards have a straight edge, using a paper cutter is a great time saver. I have had several paper cutters, but the one in this picture has been my favorite. It is compact, lightweight, and sharp! (Yes, I have accidentally touched the blade a couple of times. I can attest that it will draw blood.) I have used this cutter for a couple of years. It still cuts without tearing or chewing up my cards. 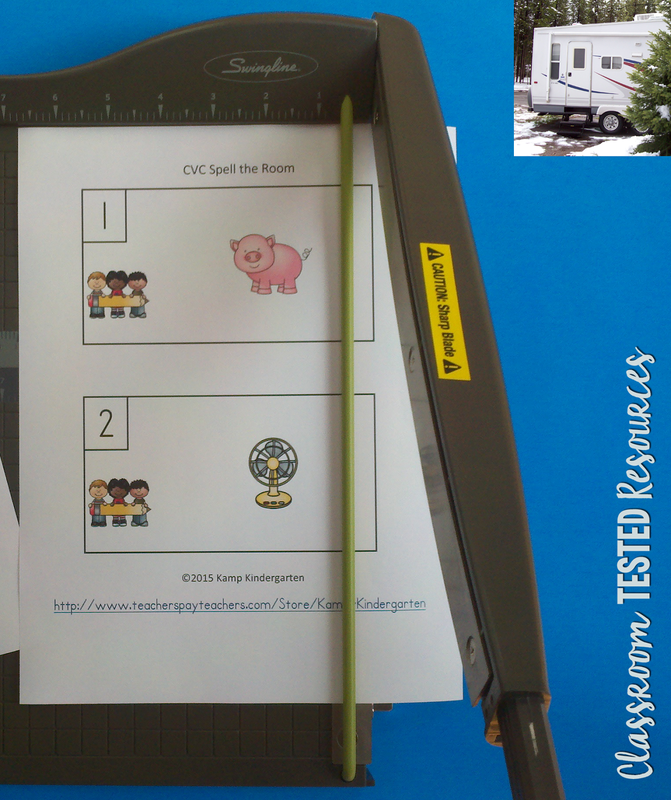 The picture above shows using the paper cutter to cut a FREE Spell the Room Resource. I like to use various containers for clip cards and clips. I find cute, fun, and practical containers at dollar stores, WalMart, and the Target Dollar Spot. I also upcycle containers from gifts I have received. 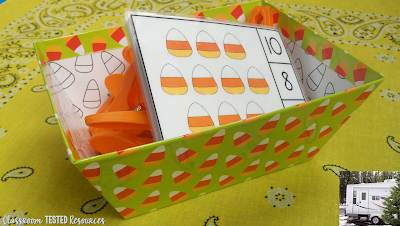 After I have enjoyed that delicious homemade fudge for Christmas or cookies for Halloween, I can still use the container for clip card activities. The picture above shows clips and cards from a FREE Count and Clip resource stored in a Candy Corn themed cardboard container from the dollar store. 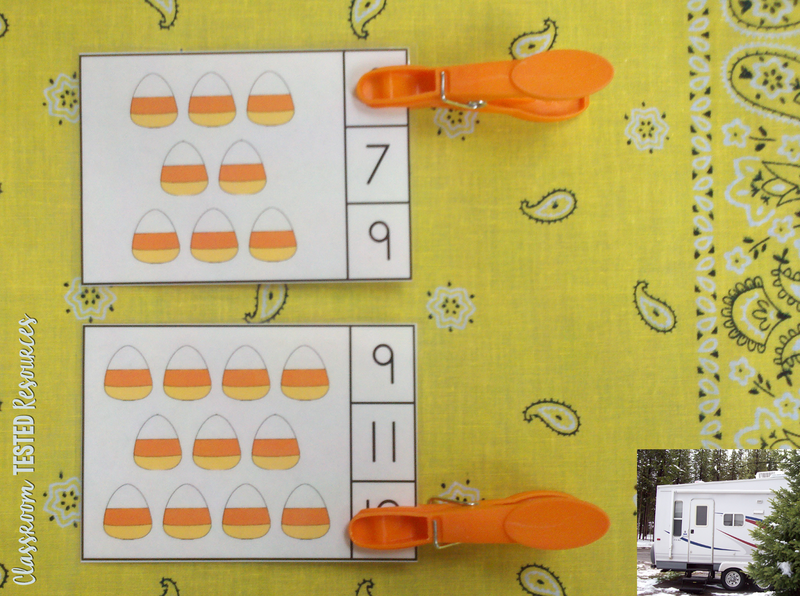 Pictured above are clips and cards from a counting resource used with a basket that was first used as a fruit basket. Zippered supply pouches are great for storing cards and clips. 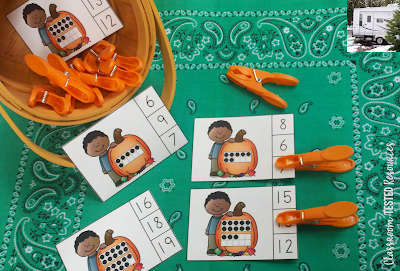 I love this idea for making early finisher activities. Using the pouches also makes a portable activity that children can take home for extra practice. The picture above shows a FREE clip card resource in a zippered pouch. Here is an option to help you save paper and keep your copy count low. 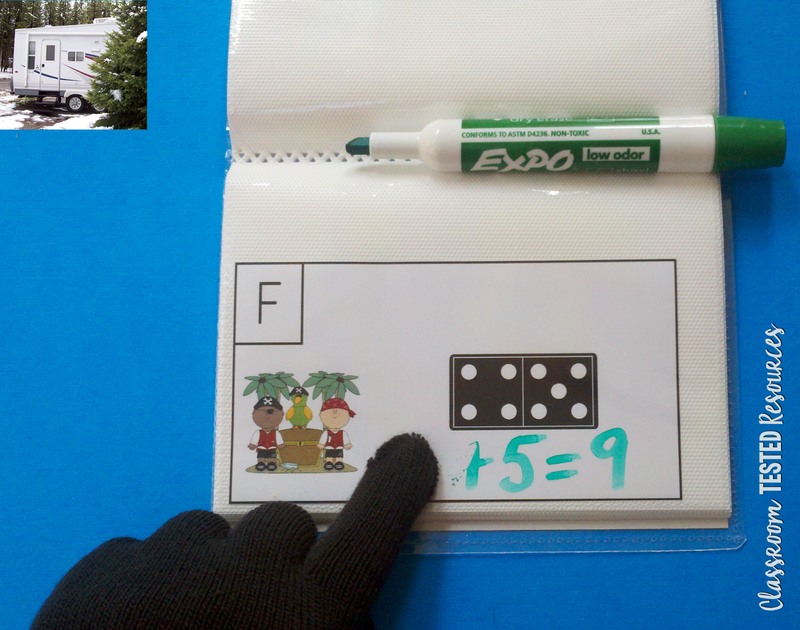 I like to put the task cards in a dollar store photo album and use dry erase markers to make a write-on/wipe-off activity. Use inexpensive black gloves as erasers. The glove in the picture above came from the ladies accessories department at WalMart, but they work well for children. Kids love using them, too. I like that putting the gloves on gives little learners an additional opportunity for motor development. In many areas of the country children have little experience with gloves. Using the gloves allows little learners in warmer climates an opportunity to learn to put on gloves. 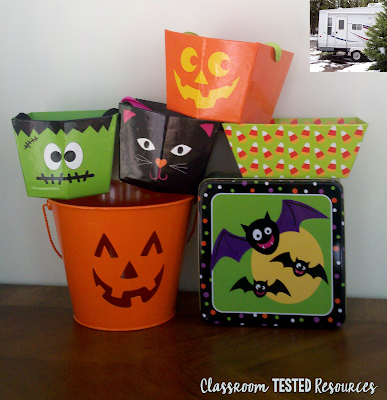 Pictured above are cards from a FREE Add the Room resource used in a photo album. Here is another paper saving way to use task cards. Instead of printing and copying response pages, allow your learners to record their responses in their journals. Journals can also be used to record responses for Round the Room activities such as Count the Room, Spell the Room, Add the Room, etc. 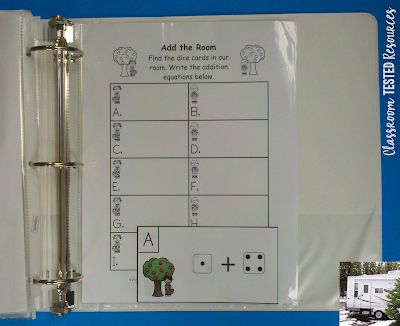 The picture above shows using a journal to record responses for a FREE addition clip card resource. 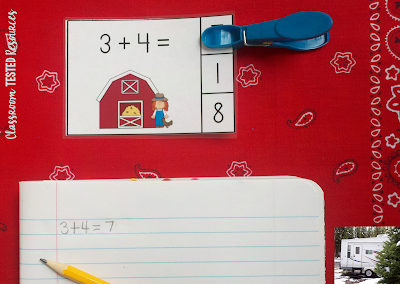 Storing task cards until they are needed next year can be challenging. I found it particularly difficult when storing cards and original copies of the response page. Storing cards in a file box and response pages in a file folder was aggravating to me. That seemed to double the time spent pulling the resources for use and then refiling them after I had used them. I wanted a way to store them together. Storing the response page and cards together in plastic page protector sleeves allows you to store them together. The sleeves are kept in a binder. 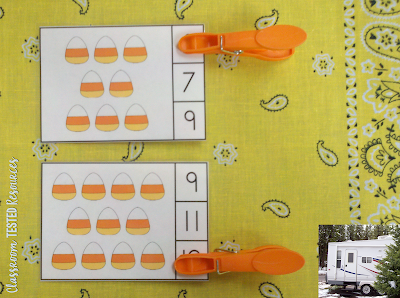 The activities can be further organized by use of binder dividers. You can organize them by subject, skill, month, etc. 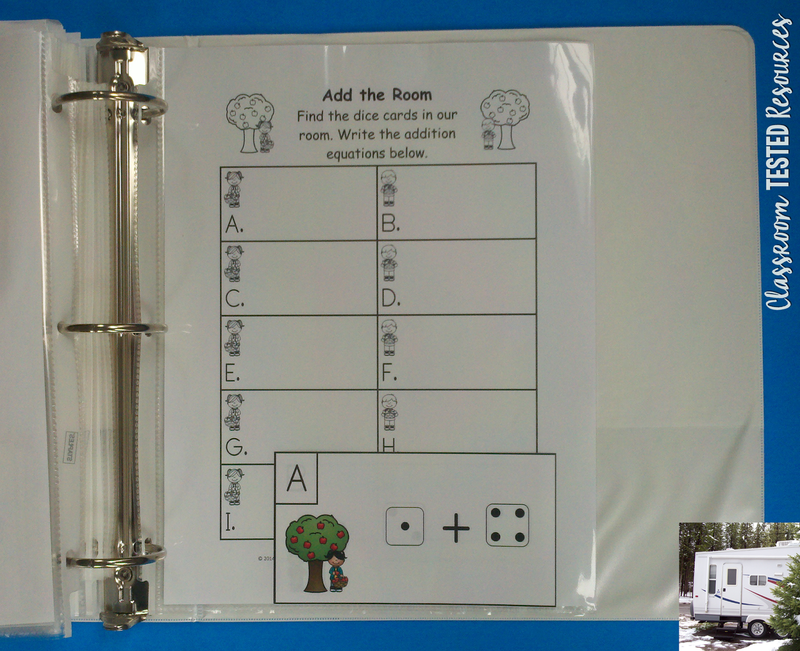 Pictured above is a FREE Add the Room resource stored in a plastic sleeve in a binder. I hope these tips help make using task cards in your class room more enjoyable for you and your learners.